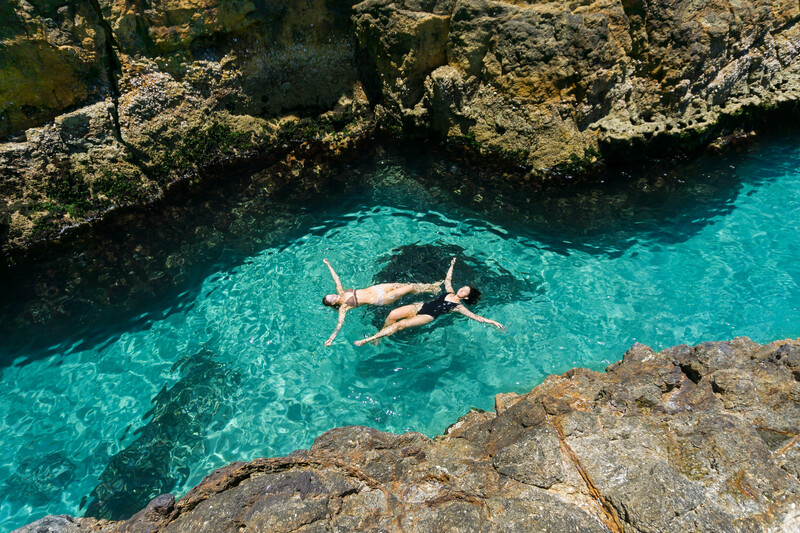 Summer…without having to think on it, the word immediately evokes a feeling of warmth, of sun kissed skin, sea salt in the air and sand between toes. Of blue skies above and the ocean pounding the beach as new waves break below before balmy evenings under open skies. Living where I do, I’m unbelievably lucky to be able to live out my summers in just that way. So lucky in fact, that I’ve gotten lazy over the years and taken for granted just what a beautiful part of Australia the eastern coast really is! This summer, I wanted to change that. I wanted to be out there amongst it, dance on the shoreline, battle the surf and head home at the end of the day so covered in sand I look like a human schnitzel! 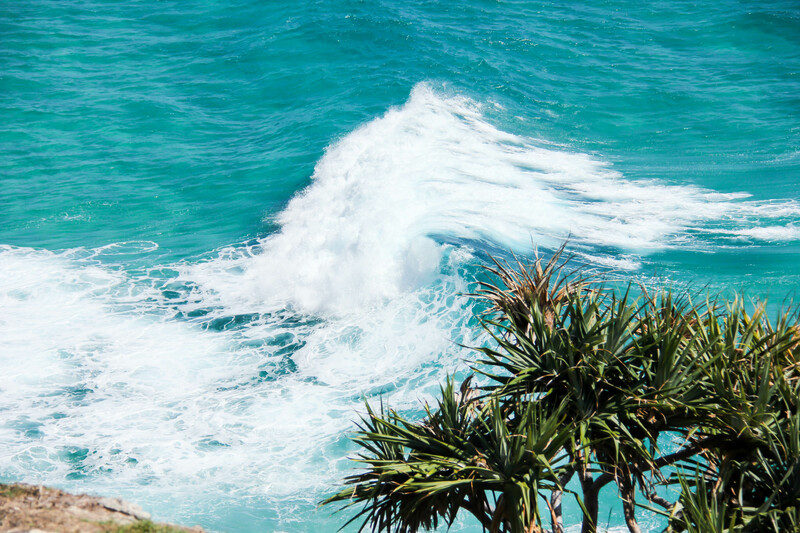 Queue a rather timely Instagram message from my new friend, Scotty Pass, with an invitation I simply couldn’t refuse – a day trip out to North Stradbroke Island! 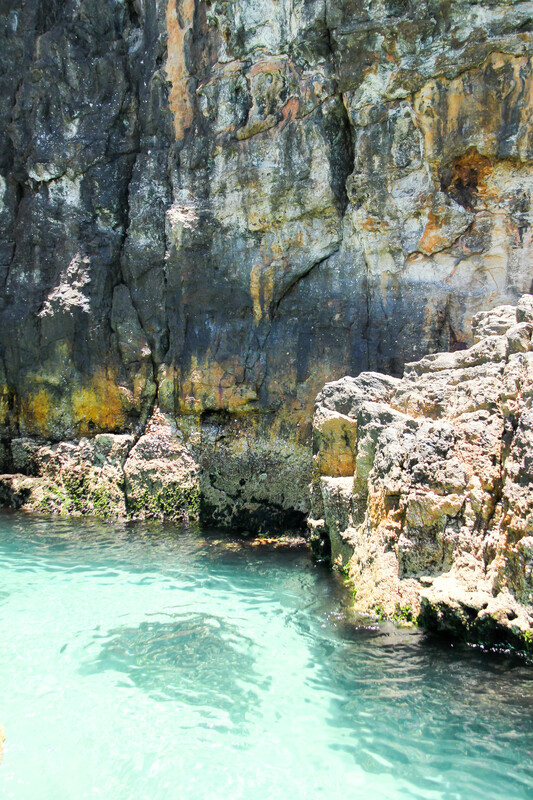 Stradbroke Island lies within Moreton Bay just off the Queensland coast. 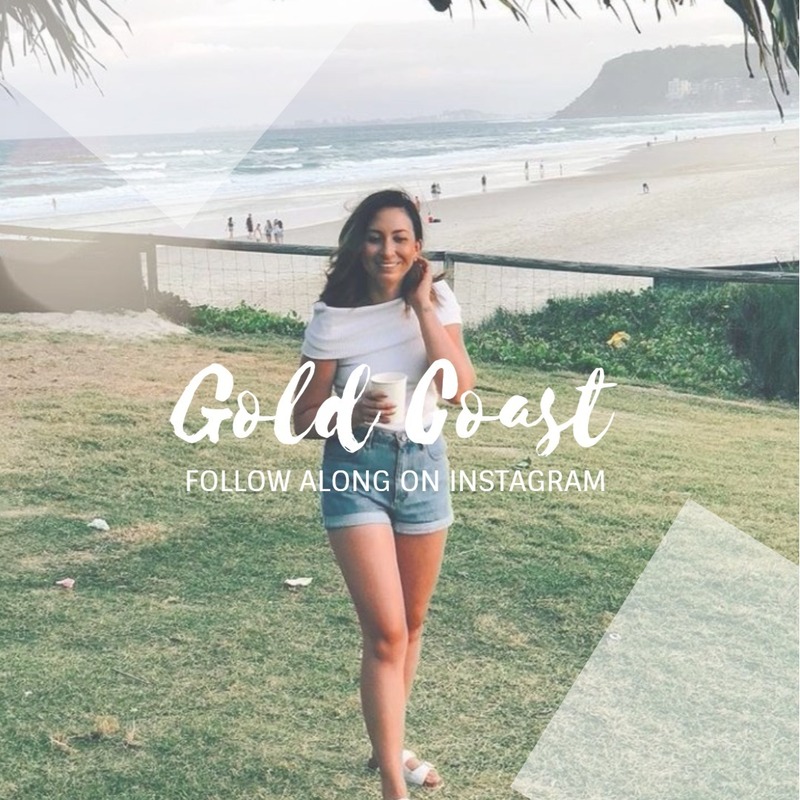 It’s easily accessible being just a 45 minute ferry trip from Cleveland, which is only a short 30 km drive from Brisbane’s CBD. Call me insane if you will, or just plain silly, but before this incredible trip, I’d never been! An island escape that is practically on my doorstep and I’d never known what I’d been missing until now. This day was the first time I was meeting Scott, Tyla, Patti and Nathan – before then, it was all on Instagram. My Mum thinks it’s strange, but I for one am thankful for the friends I’ve made ‘online’ – I’ve been lucky in that having a small audience myself, the people who come across my page have been pretty genuine ones. The kind of people you’re glad to know, and one’s that when you do eventually meet in person, you realise it’s a real kind of friendship. They’re just as mad as you are, you all laugh til it hurts and you find out you (creepily) have far too much in common. I rose early. Really early for this sleepy sloth – 4.30am! Being summer here in Oz, it helps that the sun is up just as early (by 5am if not before) and so I hit the road in the day light and made the drive out to the ferry. Introductions over and tickets purchased we made our way on board and settled in – caffeine hits first on the agenda. We made the trip as walk on passengers with Stradbroke Ferries, meaning it was just a $10 return ticket. There are sealed roads on the island that link up the three townships on North Straddie (Dunwich, Amity and Point Lookout) so you can take a car if you wish (or have kids/camping/supplies in tow). Bookings are essential for vehicles and it’s definitely the pricier option (at around $150 per car) but the ease of getting about once you arrive on the other side can absolutely make that worth it. It was a wonderfully calm morning for us, so the ride over was nice (particularly if you’re like me and suffer motion sickness). After a rather miserable week leading up to it, we were blessed with clear skies and bright, beaming sunshine. At the other end, we waited for the bus which would take us up to Point Lookout (for less than $10 return). The moment we saw ocean as the bus wound around the roads, I caught my breath. In no way was I expecting the glittering turquoise waters I saw out the window! On a day like we had, with the weather we had, it really is something else…I couldn’t wait to get out and down the coast bank and dive right in. 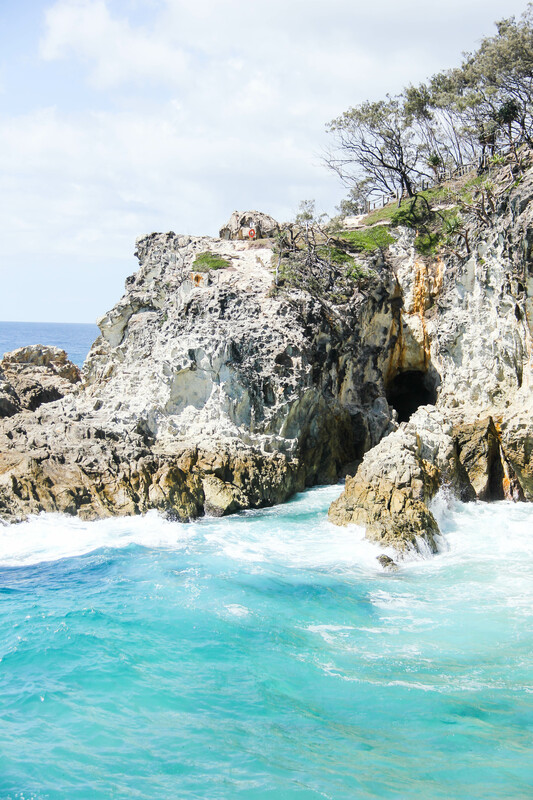 North Stradbroke really turned it on for us – aside from the PERFECT weather and conditions, we were treated to THREE turtle sightings, an enormous ray and TWO pods of dolphins all within the space of a few hours. I can’t imagine what you’d see if you spent a few days! 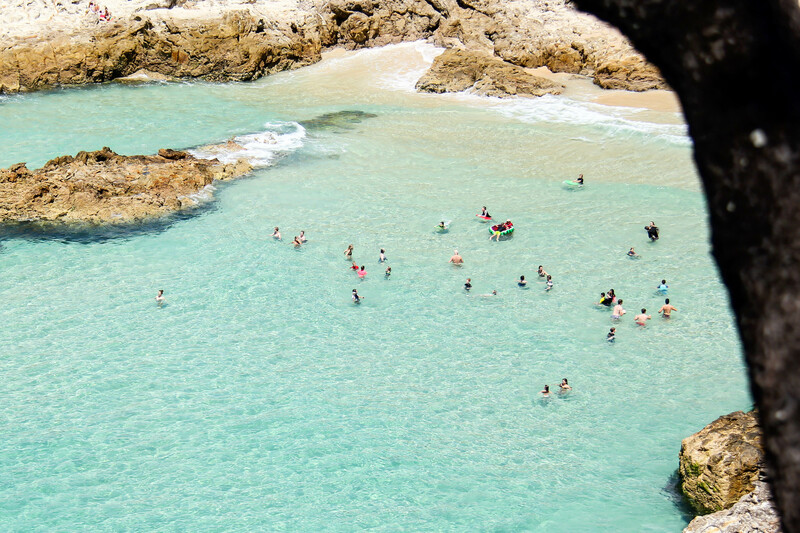 There are a number of beaches on the island to explore and plenty of activities to keep everyone happy. We did the Gorge Walk at Point Lookout, soaking up the ocean views and scaling down to swim when we had the chance/couldn’t resist it longer. We left the island exhausted, a little more than just sun kissed (oops), a few cuts and grazes (shout out to the barnacles) but blissfully happy! For the rest, I’ll let my vlog do the talking! Sometimes the best thing to do is to show somebody, when you can’t put an experience into words. A BIG shoutout to Scotty for the drone footage (check out his YouTube channel here) and to the entire crew for a truely spectacular day out! 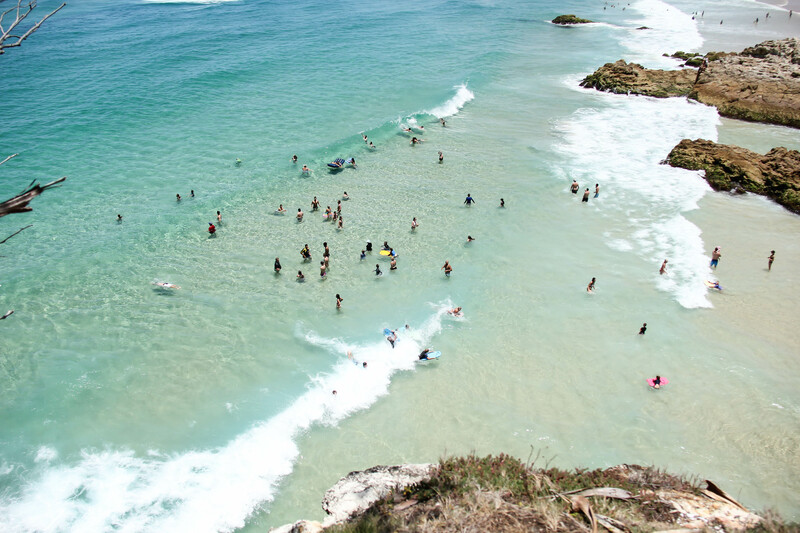 For more information and answers to any q’s you might have about North Stradbroke, head here.